Sara Higger was born in 1991 in New York, and raised in Tampa, Florida. Though a painter throughout her life, Sara was first exposed to sculpture while studying at Boston University, where she received her BFA, while taking a required intro to sculpture class. She now uses three-dimensional media almost exclusively to communicate her ideas. 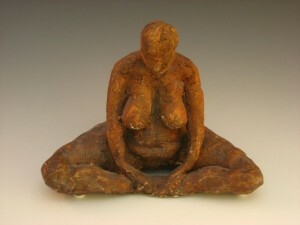 Sara uses her strong background in drawing and extensive studies in physiology and anatomy into understanding the figure and human form as it relates to her sculptures. Drawing from life is her foundation and allows her to have a stronger visual vocabulary when manipulating the figure from imagination. Sara has worked in clay, styrofoam, plaster and steel, and is always on a quest to expand her understanding of different materials and forms. She has shown her work in various parts of the U.S. and currently resides in Boston, MA where she continues to sculpt and teach.